In “Dualism and the Philosophy of the Soul” (“DPS”) in Sacred Web 4 Robert Bolton argues for the revival of “dualism” and its application to Ethics, Religion and the Arts. This essay is intended as a traditionalist’ s response to some of his arguments. It must be pointed out, however, that it is important for the general reader who may be following this discussion to keep in mind that in traditional matters there is no room for the personal views of the writer (or speaker). Tradition establishes the Doctrine, implying not only that one is to accept a revealed knowledge, but also that one has to avoid translating into human terms what is actually supra-human. To be a traditionalist is to believe with Socrates that “human wisdom has little or no value.”3 The initial problem can be stated as follows: In our approach to Tradition, how are we to understand something unless we are first equipped and prepared to do so? In an age where knowledge is believed to be something universally accessible provided it is rationally presented, it is hardly popular to suggest that traditional knowledge is not something which we acquired by being taught, but by first accepting it via faith, since in our Fallen condition we have it in a blurred state. In Platonic terms, we can say that it is not so much a matter of gaining new knowledge as it is the act of retrieving inherent knowledge. Faith can thus be taken as that resonance caused in us by the obscured memory of a kind of knowledge which is secret (internal) because it lies latent in the sacred space of our hearts. Learning in this context designates that process by which something is acknowledged as trustworthy and certain on account of the degree of intelligibility which faith obtains based on its love for Truth. Faith, then, is ultimately a modicum of knowledge on the lower level of Intelligence, which is why it is the natural gateway to Understanding, that is to say, the comprehension of traditional matters in a way where reason is willingly subject to the direction a previously assimilated traditional Doctrine. These preliminary words are to indicate that mere rational thinking does not facilitate the comprehension of traditional ideas, and that, absent faith in traditional Doctrine, any traditional critique may appear to its reader as an exercise in negative thinking based on personal opinions. Tradition teaches that preceding this primary duality there is a prior state, called Ultimate Reality, which according to the Vedantists must be understood as “non-dualism.” We want to make clear that Tradition does not argue against dualism per se in the metaphysical or physical planes; objections arise only when a dualist system proposes God and man (and/ or the physical reality in which the latter lives) as an ultimate pair. Such a position, which is essentially what we see in “DPS,” is untenable from a traditional point of view for two reasons. First because it posits a God that is placed at the same level as physical things or his creation in general; and second because it presupposes that there is no need for transcending the proposed ultimate pair. This is only conceivable within the constraints of a rational recycling of formerly metaphysical ideas. In the West, this recycling first appears as an independent “acceptable” system with Descartes. It must be stated that, with Cartesianism, Western man as a whole severs his ties with Tradition. It is not that before Descartes philosophers were not using human reason; it is rather that with Descartes Western philosophers finally articulated to their own satisfaction a humanly comprehensible way of understanding reality, without realizing that the sole reality reason can understand is the very one it creates. With Descartes, in short, philosophers found that reason can build its own explanation without the need of any Revelation, and that one can also see how it is possible to explain God without having to resort to any supra-rational mode of knowledge. A reason-made God thus emerged, along with other constructs of man unaided by Revelation. A kind of God whom man could certainly kill without being irrational since he created Him in the first place with the aid of reason, a cognitive capability which could never see itself transcend the very limits which made it possible. We can easily see that in philosophy one can be a rationalist and be against some specific points of Cartesianism, or indeed against any system which emerges out of a reasoning independent of Tradition or of any connection whatsoever with any traditional system. We read in “DPS” that Guénon and Schuon implied that they believed that Ramanuja, al-Ghazali, Maimonides, and St. Thomas Aquinas “were all incapable of teaching Monism because they lacked the necessary knowledge.” We cannot answer such a statement since Bolton does not make use of references in his paper; we can, however, state that all those authors were engaged in presenting the traditional Doctrine to people whose basis for accepting the Truth was logical thinking. We must remember that the Latin title given to Maimonides’ Moreh Nebuchim, Dux Perplexorum (The Guide for the Perplexed) shows that its author was writing for those who were in a doubtful state of mind regarding the possible harmony between religion and philosophy.6 One must also keep in mind that, for medieval traditionalists, philosophy was married to Revelation since logic operated under the guidance of faith in the tenets of the traditional Doctrine. Logic without faith could thus be likened to a dog, barking at its own image in a mirror. Human logic is more like an echo: it gives you back what you first placed there in your mind. Logic is a tool for showing, not creating, the truth. As an instrument of human reason, logic informs the web of your comprehension to the outer reaches of your beliefs. The thread of logic emerges from the spider you create with your faith. The proofs of logic are foreshadowed by whatever your reason has accepted at the deepest level of your faith. There is no objectivity in human reason. Objectivity belongs to the metaphysical realm; to the degree that we are able to capture a glimpse of that realm, we may be permitted a shadow of Truth which can only manifest in a single moment of Totality. Traditionalists like al-Ghazali or St. Thomas were engaged in the first phase of the traditional Doctrine: to meet man on his own ground, the minefield of reason—one from which not even the best traditionalist emerges unscathed. The most perfect exposition of metaphysics becomes merely an avoidable abortion. It is well known that St. Thomas’ purpose in his Summa Theologiae was to put reason under the guidance of faith in the truth of the Christian Doctrine. Yet, in the end, the overwhelming marshaling of proofs do away with any possibility for intellectual light to come through with due splendor. Too much logic obscures the delicate texture of real light. As for al-Ghazali, the reader of Deliverance from Error soon discovers that its author opposes the philosophers who are not guided in their thinking by a revealed Truth. The fact of the matter is that with regard to traditional topics there is no possibility of understanding without faith. The first debatable issue as proposed in “DPS” is that God appears as part of a sort of dualism without any further qualification. The fact is that by giving no definition of God, “DPS” makes it very difficult to be followed as a self-cohesive revival of dualism. For the traditionalist, to say “God” is to invoke a Reality which is an all-embracing entity with a metaphysical dimension. To say “God” implies that what you see around you is—and must be—in some way a part of that which embraces everything. Note, however, that “everything” here causes the argument to shift from its initially rational nature to its real supra-rational level, since “everything” belongs to “God.” And so it would be more appropriate to state that the argument has returned to its true origin, which is in fact the supra-rational. But since “DPS” has overlooked the need to locate its argument in the supra-rational, for the traditionalist anything else that the article may say is bound to lack a sound foundation. Arguably, the duality of the soul and God could be an ultimate reality, if it could be shown that mystical self-transcendence was explicable as an internal development in the soul, prompted by its relation to God. Such a misplacement illustrates to the following problem: How can one demonstrate any mystical development in a convincing fashion to one who does not believe in mysticism? Either one believes in it, and thus one reads the “proofs” provided by the testimonies of real mystics, or one does not, and therefore no amount of reasoning will ever suffice to persuade one of the actual genuineness of a mystical experience. But, more importantly, on what basis are we to take the “duality of soul and God” as “an ultimate reality”? Since duality is the issue in “DPS,” what is the role of the body whose soul is expected to function as a partner with God in the “ultimate reality”? Without a definition of “man,” where is the anthropological reference-point of this dualism, one in which the definition of soul is equally absent? In the section titled “Modern Anti-Dualism” we find a great deal of information with regard to consciousness. If we understand Bolton correctly, he promises there that he will show later that consciousness creates, not the object, but “much of what makes it recognizable for us.” In the context of a rational approach to consciousness, such a statement is an undisputable fact. Yet we may ask: What is the relevance of proving the central role of consciousness in a system which cannot in the end expect man to have knowledge of God by means of his ordinary consciousness? In other words, how can this reason-based dualism include God if in fact—according to most rationalists—God is not actually discernable by means of the rational faculty, that is to say, by the rationalist’s chief instrument of apprehension? Now, since we are dealing here with an English translation of a book which, although originally written in Hebrew, has throughout history been considered in its Greek version, we must go to the Septuaginta in order to see if the rendering is correct. By comparing both texts we find a subtle but important distinction. The English “look upon” is not an exact rendering of the Greek “εμβλεψον”; “look into” would be a better choice. This is confirmed by the Vulgata rendering: “intuere in” (“to intuit”), which in the cadre of biblical doctrine means “apprehending by intuition,” or apprehending by means of deeper contemplation or meditation on the inner aspect of the object of meditation. The important point to note is that the term designates a vision that is directed to the interior dimension of things, namely their essence. It does not, however, refer to an act of “intellection” stricto sensu, since the matter of which Sirach speaks is Sapientia, practical knowlege, “practical” in that it relates to the sphere of “doing” in accordance with the Law. In Christian terminology, one would say that Sirach belongs to the vita activa. A second observation can be made. We note in fact that the pairs given (good/evil; life/death; godly/sinner) pertain to the moral sphere. The moral uniformity is preserved throughout, if we consider that in a sapiential book “life” is the state that corresponds to the continuity of good works, just as death reflects the continuity of bad actions. Read in this way, verse 15 does not point to the endless pairs of opposites which may be out there, in the physical world—as Bolton implies. On a dispassionate reading of the text, verse 15 is actually addressing the individual who might be engaged in the first phase of transforming his mere human nature into the divine; it is telling him to exercise “intuition” so as to perceive in the “works of the most High” a relation of opposition which is internal, related to the inner life. Observe, moreover, that there are said to be “δυο δυο εν κατεναντι του ενος” (literally: “two and two, one against one”). Approached “intuitively” the statement suggests that the individual has to take first the opposites in their full contrary deployment— here, evil is against good, and good is against evil (“two and two”). In a synthetic fashion, though, we are also given the perspective of a binary, with its opposing components. We can then say that the individual is exhorted to begin by discerning the evil which is in each good, and the good which is in each evil, since on the human plane there is no good that is merely good, for this would be Absolute Goodness. After this, the individual is expected to have worked out the synthetic discernment of an opposition nearer to its pristine state, namely that which is exhibited by the “Tree of good and evil” which resides in the Garden of Eden, the sphere which, when regained, restores to man his primordial nature. We may remember that, according to Guénon, it is precisely the “confusion between the luminous [good] and the dark [evil] aspects that properly constitutes ‘Satanism.’”8 We need hardly remind the reader that such a confusion is what best characterizes these postmodern times. Turning next to the passage from Matthew 10:28 to see if it can be used to support the proposition of duality of body and soul in Christianity, the English translation of the text reads as follows: “And fear not them who only kill the body but cannot kill the soul.” Here again we must try to place the verse in context. The first thing to note is the lack of the latter part of the verse, without which the full meaning cannot be determined. It reads: “But rather fear Him who is able to destroy both soul and body in hell.” Next, we realise that the speaker is Jesus and the addressees are the Apostles; this calls for caution, since anything said in that setting is likely to be “mysteric,” that is, something related to the mysteries of the “works of God.” We must therefore take especial care to ensure that the English translation can be trusted. Referring to the original Greek text, we note an important objection: the Greek γεεννα (gehenna) here is not equivalent to “hell” as the concept has come to us via external religion. Mere rational logic applied to this passage taken in its literal sense yields us no “logical” explanation capable of withstanding further analysis. Consider this: what purpose does it serve to kill the body in the context of religion, and to kill the soul thereafter? And if that question does not make us suspect that something is not quite right with the literal reading of our text, let us ponder another matter: how is it possible to kill the soul, if the soul is synonymous with Spirit? Only when we concede that we are here witnessing the instruction that Jesus gives his closest disciples regarding the “death”—which pertains to the second phase of “rebirth”—only then are we ready to “look into” (“intuere”) the heart of the matter. Let us enter then this topic with the eyes of our faith wide open. In the New Testament, body and soul are not two elements of a pair of opposites, but of a ternary of which Spirit is the third component. Furthermore, in this ternary, “body” is not to be taken as the “physical” part of man—the “body” is “physical” only to the extent that it is viewed as the vehicle for a sensorial mechanism which may lead to sensuality and thus to passions. Therefore, as far as the process of “rebirth” is concerned, the “body” refers to that crystallization which has come about by the continous practice of certain habits which have their real origin in the unregenerate “soul.” The “soul” then is what we could envision as a set of fountains of desires, or, if you like, an endless need for self-gratification. It is “endless” because the “soul” is similar to the nature of a “form,” in the Platonic sense of the term, an “archetype” which encompasses all the possibilities of its essence. In the human “soul” all the “forms” are present in a reflected state; their concretions give shape to the “world”—not the world that we know “out there.” The “world” refers to the materialistic concretions “created” by the desires of the disciple under the influence of his sensuality. The good desires are up there (an “up there” which is still within the individual), shaping the shapeless heavens of the first creation that precedes “time,” the measurement of “consciousness,” which is “con-scientia,” the “scientia” or knowledge in man which coincides with the knowledge of God. Now all of these—the desires and their materialization—have to be destroyed, killed, annihilated. But just as when we want to get rid of a tree we first chop down its branches as well as its trunk, only thereafter proceeding to dig up its roots (which would extinguish any further “possibility” for the tree to exist as a life-producing mechanism), the disciple who wants to be rid of his mere “human” nature has to seek out the “Divine” nature which alone knows and possesses the means to eradicate the “body” before proceeding to eradicate the “soul”—the root of the body—lest its habitual sensual behaviour renews itself in time. Thus first we have the killing of the “body,” followed by the killing of the “soul,” not as two components of a pair of opposites but as the two constituents of a correlation (which exists within a ternary) which have to be destroyed by God with the co-operation of man as the latter becomes “conscious,” or awakens to the task of sharing a common ground of knowledge with God. Let us now turn to the binary body/soul which Bolton cites as an example of Plato’s dualism. To begin, it would be in order to give the general reader the basic concept of Platonic dualism. Essentially what Plato says is that this world of ours is the reflection of a model which exists in the metaphysical realm. That statement, to be sure, needs some qualification. To begin with, the reflected state of this world implies a difference in kind with respect to its model, since the former is physical while the latter is metaphysical. Upon closer examination, however, this is not quite the case. If we take into consideration that for Plato physical things participate in their archetypes, then it would be more accurate to say that the reflected is a physical thing whose underlying nature coincides with—and is what constitutes the essential reason for being an image of—its metaphysical model. Thus the first observation arising out of this Platonic view is that this world, in a mysterious way, contains within itself some element of the metaphysical nature of its model. What we have in this plane of existence is therefore the particular mode which the metaphysical adopts when it decides to project itself beyond its own plane, the projection in itself being the creation of the physical plane and its content. Briefly put, the physical is a modality of the metaphysical, provided we look into, and not at, it. Now, if this view of things is correct, we may have to concede that superficially this world and its metaphysical model would appear to be a pair of opposites, which supports the argument for dualism; at a deeper level, however, we cannot speak of an unqualified dualism in Plato. The above explanation reveals that a created thing is a composite, a rebis; thence it follows that it must be as a rebis that the thing created is a reflection of its model. The advantage of this view is evident when we keep in mind that the metaphysical duality in the invisible sphere is the model for the kind of duality which we find in our world. And he adds afterwards that the same ordinary people “are not at all aware in what sense true philosophers are half dead.” For Plato “death” is merely the “separation of soul from body,” understanding that “soul” is “most like that which is divine, immortal, intelligible, uniform, indissoluble, and ever self-consistent and invariable,” while “body” is “most like that which is human, mortal, multiform, unintelligible, dissoluble, and never self-consistent.”9 Thus “death” here is that separation of the soul from the body whereby the former is kept free from the evil influence that arises from contact with the latter. Now if the body were something absolutely different from the soul, no harm could ever come out of any close relation between the two. That the body does affect the soul in a negative way indicates that the latter’s nature coincides in some manner with that of the body. Hence body and soul can at some level at least be considered to be correlated. At this point, we note that Plato does not state exactly that the soul is “divine, immortal” and so forth, merely that it is “most like” those things. With traditional matters especially, one cannot overlook the minute details of the text; a single word may very well hold the key to the correct interpretation. Plato proposes here a high degree of ressemblance between the soul and the divine, on the one hand, and between the body and the human, on the other. Consequently what we have here is a soul which is open to two possibilities. The first option for the soul is to increase its similarity with the divine by cutting off any relationship with the human; the second is to let itself be assimilated with the human by allowing mortal things to be the focus of its interest. We insist then that, by looking into the deeper nature of this alleged pair of opposites, there is little ground to believe that they evidence a real dualism. The duality we find in this world is a shifting reality. To analyse it is to traverse the territory of quicksand, forever moving, never offering you the fixed reference point needed to establish the certainty of its real twofoldness. To glean an overview of the true nature of duality from the standpoint of Western philosophy at a time when philosophy was based on metaphysics, one can read Heraclitus (called the Obscure by those who were blinded by his light). Any one of his sayings can become a springboard for the Philosophia Perennis; on the topic of dualism, we might consider the following: “φυσις κρυπτεσθαι φιλει” (“The essence of things loves to hide”).10 This saying places us on quicksand, without warning: what we see, is not what is. Something hides beneath the veil we have assumed to be the real thing. Something that plays with our senses. It is not that the senses are wrong, simply that this play is unavoidable on account of the co-existence of two different elements, one of which is real (since it is permanent), the other an illusion (since it shifts continuously).Over the senses there is the νους (“mind,” “intellect”) which apprehends the λογος (“logos”, the hidden reality behind the veil). This is the duality which—Heraclitus says—we find in the world; it is made of something which, while it changes, nevertheless remains unchanged. Two elements interlocked in play, needing opposition to reach harmony. We are approaching Maya now from the Western perspective. Let us be extremely careful now, for we are nearing quicksand. Returning to the traditional view of Reality, we can say that manifestation has two equally acceptable possibilities: it can be perceived as “illusion” or “magic” performed by the real Essence—in which case we look upon things as Maya (understood as “unreal” in the same way the sphere, the triangle or the square, are unreal with respect to the “real” clay); or it can be viewed as a legitimate representation of metaphysical Reality, displaying Itself in the only fashion possible in the physical plane (in the same way as ice is the only possible form for water to manifest in solid dimension). In this latter sense, Maya is no “illusion” at all. The important point to observe is that any manifestation, at any given level, presupposes a dualism formed by the primary element and its manifested state—an operation that discloses the two different planes involved. This in turn presupposes that at the very outset there must be a mysterious single element, subsisting alone as the very root of everything else. This “reflection,” Guénon adds, is a duplication, which is obviously a manifestation, although metaphysical as yet. In the Qabbalah it is by the fourth stage of the process of unfolding that “It” appears on Its physical and last modality of manifestation. According to the Zohar, “It” is “the most Mysterious,” who, in the opening sentence of Genesis, is said to have created Elohim14. In the New Testament we have the process of reflection of the root of Reality in the Father, for He duplicates Himself in His Son, thereby creating the primordial polarization, since it takes place in and by the Arche (Beginning, Principle, the equivalent of the Hebrew Reshith in Genesis 1:1). We can imagine the Father before His duplication as an entity which contains the Son in an undifferentiated state, while the Father after His duplication has to be envisioned as a polarized entity, one in which He plays the unmanifested component of the (metaphysical) manifestation which has been assigned to the Son. In the next stage of deployment, the Son assumes the unmanifested role, manifestation being now granted to his duplication, namely the Archetypes which are the models for the manifestation of the physical reality. And it is at this level that we once again encounter the twofold nature of things—a necessary polarization: the unmanifested (the reflection of the archetype in the visible plane) and the manifested (the physical component of things). From a traditionalist standpoint, the persuasiveness of the dualist arguments advanced in “DPS” will depend on more than the viability of its rationalistic arguments. We must keep in mind that if reason were a selfsufficient tool to prove the validity of any argument, then there would be no cause for disagreement on any given issue presented in a rationalistic fashion. But this is not the case, since the rationalists themselves have never—and will never—agree on any major issue, since reason, divorced from its real source (Intellect), is unable to rest on objectivity. By way of conclusion we must remind the reader that, for a traditionalist, to propose God as part of a dualism which has been established on the basis of mere human reasoning is to have turned the argument to a dead-end. For if one evokes God as understood by human reason alone, then that God is merely a rationalistic entity, a distorted, humanized God unable to survive the differing subjective viewpoints of each ego-centered reasoning faculty. On the other hand, if we regard dualism in its traditional sense, then reason is subordinate to the Intellect which bring it back to its roots—the metaphysical realm. Reason usually divides in two anything it touches in order to grasp more simply the multiple fields of phenomenic Reality first detected by the senses15, whereas the Intellect guides the inner vision through the uncut passage of a Reality that precedes its physical manifestation. It is here that we find that “one” is made of the dynamic unified state of metaphysical dualism which springs from the non-duality of that which lies at the very foundation of possibility. But in order to safely speak of these things, we need the guiding light of Intellection or Tradition, lest we (unwittingly) talk about “intellectual” issues from the standpoint of mere human reason—the mistake that modern man has been making for the past few centuries. 3 Plato, Apology, in The Last Days of Socrates, New York, Penguin, 1979, p52. 4 René Guénon, The Reign of Quantity and the Signs of the Times, Ghent, NY, Sophia Perennis et Universalis, 1995, p19. 5 Frithjof Schuon, In the Face of the Absolute, Bloomington, IN, World Wisdom Books, 1984, pp 54-55. 6 Julian Marais, History of Philosophy, New York, Dover, 1967, p156. 7 Montague Rhodes James, “Preface” in The Apocryphal New Testament, Oxford, OUP,1975, pxlv. 8 René Guénon, The Lord of the World, North Yorkshire, Coombe Springs P, 1983, p17. 9 Plato’s Phaedo in The Last Days of Socrates, New York,Penguin,1979, p107-132. 10 Heraclitus, “The Fragments,” in Charles H. Kahn’s The Art and Thought of Heraclitus, Cambridge, Cambridge UP 1981, p32. 11 Heraclitus, “The Fragments,” in Charles H. Kahn’s The Art and Thought of Heraclitus, op. cit. p53. 12 Sankara, Crest-Jewel of Discrimination, Hollywood, Vedanta Press, 1978, p63. 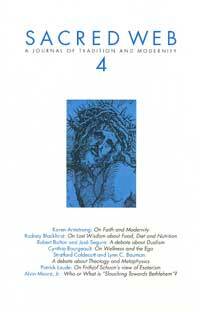 13 René Guénon, Symbolism of the Cross, London, Luzac, 1975, p82. 14 The Zohar, London, Soncino Press, 1973, Vol. I, p63. 15 We should remember that the dual view of reality is as acceptable as the trinitarian one; “black and white” is only a preference over “black, gray, and white.” This preference is valid because we move in the relative aspect of reality, wherein a given view is the result of a previously selected particular perspective. Fixity—and therefore a certain degree of “objectivity” valid not only for one person but for many—is possible when a metaphysical point of view is introduced in any given field of visible reality. Such an introduction, however, always causes a sort of “disruption,” the best proof of which—in the West—is constituted by the rejection of the “good news,” the news of the Good, on the part of the character called (false) “Jew” in the New Testament’s sacred terminology, for the Truth is never welcome in the field of lies. On the other hand, for those who are seeking the Truth outside sectarianism, the inevitable disruption will cause them to misunderstand what they hear or read at first, since the real knowledge they are presented with is first apprehended by an ill-prepared, all-too human, cognitive faculty. The disruption factor can never be overemphasized for the simple reason that Truth is not, as we all too often assume in this profane society, a matter that can be understood without living it. Truth indeed is never something for dialectical display, but an endless spiritual process which pertains to the painful program of “metanoia” (a going beyond the present state of the human mind) which the soul must undergo. Anything else may turn out to be the fancifully brainy temporal noise made by the more or less correct arrangement of words displayed on paper. At any rate, the fact is that, in a very curious way, the clearer the Truth is stated—if ultimate clarity is ever possible—in its theoretical configuration, the less the chance that it will be correctly understood by us humans. The reason for this is that, for the mind, the Truth is blinding and confusing, while for the ego, it is unfriendly, unfounded, even disturbing.